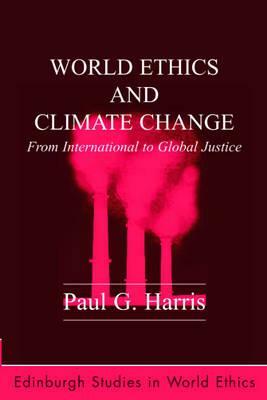 Paul G. Harris, World Ethics and Climate Change: From International to Global Justice (Edinburgh University Press, 2010). More than two decades of international negotiations have failed to reduce adequately emissions of greenhouse gases that are causing global warming and climate change. This book identifies a way to escape this ongoing tragedy of the atmospheric commons. It takes a fresh approach to the ethics and practice of international environmental justice and proposes fundamental adjustments to the climate change regime, in the process drawing support from cosmopolitan ethics and global conceptions of justice. World Ethics and Climate Change makes a case for “cosmopolitan diplomacy,” which sees people, rather than states alone, as the causes of climate change and the bearers of related rights, duties and obligations. The book describes the role of ethics and justice in world affairs and demonstrates that climate change is a matter of extreme injustice; summarizes and critiques the flawed doctrine of international (interstate) justice upon which governments have premised climate change agreements and policies; examines the practical and ethical significance for climate change of growing numbers of new consumers in the developing world; and proposes a cosmopolitan approach to climate change that is more principled, more practical and more politically viable than current international policies.